Fewer Canadians are feeling strained by higher interest rates even as borrowing costs rise, polling data show, findings that should bolster the Bank of Canada’s confidence to tighten credit further. Some 41 per cent of Canadians say higher borrowing costs are having a negative impact on their personal spending, down from 43 per cent three months ago, according to a survey by Nanos Research taken after the central bank raised interest rates in October, for a fifth time since mid-2017. 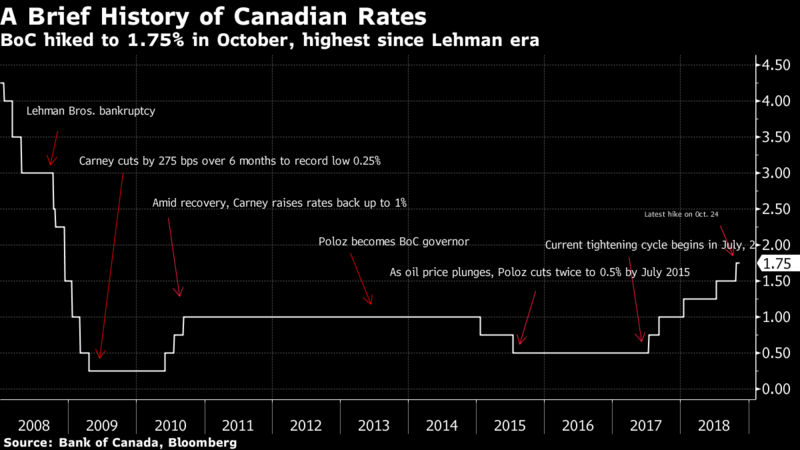 Governor Stephen Poloz has cited elevated levels of household debt for the central bank’s “go-slow” approach to tightening monetary policy, saying the economy is more sensitive than in the past to higher interest rates. The latest survey data from Nanos indicate the impact on a majority of Canadians has been muted, and the situation is stable. Investors are anticipating at least two more hikes within the next 12 months. One demographic that isn’t so sanguine is the youngest. Some 51 per cent of those aged 18 to 34 say higher rates are having a negative impact on their spending, compared with 45 per cent in a survey three months ago -- a generational gap that could complicate the central bank’s efforts to explain why it’s raising borrowing costs. Lawmakers have already begun to raise the issue with Poloz, who was quizzed about the impact on young people at a parliamentary committee hearing two weeks ago. One reason millennials are feeling the pinch of higher rates more than others may be that as a group, they are taking larger mortgages as a share of their income to enter pricey housing markets in Toronto and Vancouver. But there isn’t much the Bank of Canada could do about it, since it needs to worry about the overall health of the economy rather than how the costs get diffused, according to Craig Wright, chief economist at Royal Bank of Canada. “I wouldn’t say the bank wouldn’t care about the distributional impacts, but their tool is a very blunt tool,” he said. Nanos conducted the polling on behalf of Bloomberg between Oct. 27 and Nov. 1. The following are the results from the hybrid telephone and online survey of 1,000 Canadians.